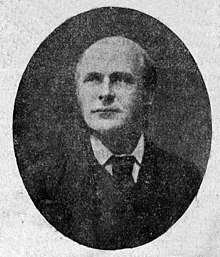 Granville Augustus William Waldegrave, 3rd Baron Radstock (10 April 1833, London – 8 December 1913, Paris) was a British missionary and a Peer of Ireland. He became the 3rd Baron Radstock on the death of his father Granville George Waldegrave in 1857. Radstock married Susan Calcraft (1833–1892) on 16 July 1858 in Trinity Church, Marylebone. She was the youngest daughter of John Hales Calcraft, MP for Wareham, and Lady Caroline Montagu, daughter of William Montagu, 5th Duke of Manchester. In 1889, they acquired the Mayfield estate in Weston, Southampton. Radstock is perhaps best known for his work as a missionary during the Great Russian Awakening. In 1874, he travelled to St Petersburg as part of his missionary work, trips that were repeated in 1875–6 and 1878. This biography of a baron or baroness in the Peerage of Ireland is a stub. You can help Wikipedia by expanding it. This page was last edited on 2 July 2018, at 12:22 (UTC).